(NaturalNews) Last Friday, the city council of Berkeley, California, voted to keep mercury hidden in dental fillings, keeping consumers in the dark on the fact that they are all being poisoned with a deadly neurotoxin that causes permanent brain damage. This decision to keep consumers in the dark was, of course, supported by dentists and doctors -- both of which have a long history of covertly poisoning their own patients while refusing to disclose the damaging effects of the deadly chemicals or toxic heavy metals they routinely (and profitably) use. It turns out that "amalgam fillings" are intentionally and deliberately misnamed for the express purpose of misleading consumers. Those fillings are actually more than 50 percent mercury, and once installed in mouths, they off-gas mercury vapor which is then inhaled by the patient, entering their bloodstream and causing permanent cellular damage to heart, kidneys, liver and brain. Click here to see a video of mercury fillings off-gassing deadly mercury vapor. There's also a stunning video from the University of Calgary that provides visual proof of mercury damaging brain neurons. If you've never seen this video, click here to watch it now. The dentistry industry knows that mercury is extremely toxic. It's one of the reasons why so many dentists are clinically insane. They've come into contact with so much mercury of the years that they, themselves, are victims of it. That's why so many retired dentists are stark raving mad. The "mad hatter" effect is what happens when you touch, absorb or inhale too much mercury over the years. So instead of trying to remove mercury from fillings -- which would be the obvious solution here -- the dental industry has, for decades, engaged in a delusional campaign of denial, pretending that mercury fillings are somehow not toxic. Could this be because the dental industry organizations also happen to own patents on mercury fillings and earn huge revenues every time one is purchased for use on a child? Thanks to modern dentistry, mercury is "the poison that keeps on giving." Even after poisoning the patient, that same mercury goes on to poison the world. How? When people who have mercury fillings die, many are cremated. This causes the mercury in their mouths to be "cooked off" and turned into a deadly gas that gets blown right into the atmosphere. Mainstream environmentalists are quite familiar with the idea of mercury being released by coal power plants, but almost nobody talks about mercury being released from the cremation of patients who have been implanted with mercury fillings. The EPA openly confirms this, by the way, stating, "if mercury-contaminated sludge is used as an agricultural fertilizer, some of the mercury used as fertilizer may also evaporate to the atmosphere. Through precipitation, this airborne mercury eventually gets deposited onto water bodies, land and vegetation." If the amalgam waste is sent to a landfill, the mercury may be released into the groundwater or air. If the mercury is incinerated, mercury may be emitted to the air from the incinerator stacks. And finally, if mercury-contaminated sludge is used as an agricultural fertilizer, some of the mercury used as fertilizer may also evaporate to the atmosphere. Through precipitation, this airborne mercury eventually gets deposited onto water bodies, land and vegetation. Some dentists throw their excess amalgam into special medical waste ("red bag") containers, believing this to be an environmentally safe disposal practice. If waste amalgam solids are improperly disposed in medical red bags, however, the amalgam waste may be incinerated and mercury may be emitted to the air from the incinerator stacks. This airborne mercury is eventually deposited into water bodies and onto land. Mercury amalgam also accumulates on dental supplies, such as cotton swabs and gauze, and these materials are usually deposited in the regular trash. In local areas where trash is incinerated, the mercury in this trash can be released via air emissions. Of course, they know they're lying about mercury, just as they're lying about GMOs, vaccines, psychiatric drugs, glyphosate, triclosan, aspartame and all the other poisons now devastating our world. It's time to stop the dentistry holocaust and outlaw the use of mercury in both dentistry and medicine. Mercury has no place whatsoever in the dental practices of a civilized society. We have suffering mercury poisoning for too many generations, and We the People will no longer tolerate the denials of a corrupt, profiteering industry that earns money by installing neurotoxic substances into the mouths of children. P.S. There is no "safe" form of mercury, as is sometimes claimed by the poison pushers. Mercury is toxic in all its forms and isotopes. You can speciate mercury all day long, but you'll never find a form that's a nutrient. 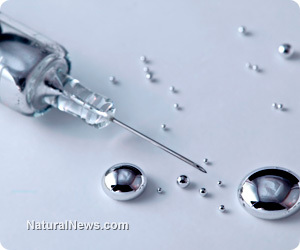 Every form of mercury is poison to life on our planet, without exception! (Ethylmercury, methylmercury, inorganic mercury, etc.) Click here for a great online resource explaining the different "species" of mercury most likely to be encountered.